The Jack Russell Terrier was developed in Devonshire by a 19th Century English clergyman named Parson John Russell, “Jack” to his friends. He wanted an efficient hunting dog and decided to design the dog he had in mind. The result was an athletic, exuberant dog who won hunters over with its intelligence, determination, and intense desire to hunt. Jack Russells were used primarily to hunt small game, particularly the red fox, which they would dig out of their den. The Jack Russell is also known as the Parson Russell Terrier. 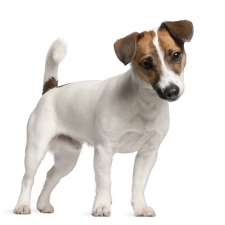 The working types remain Jack Russells while the American show types are known as the Parson Russell Terrier. If you have the time and patience to devote and train these little dogs, you will find that they have many wonderful qualities that make them an ideal family dog. They’re devoted to their families, especially children, and love being with them. They are so cheerful, spirited, friendly, and utterly fearless. Jack Russells can learn tricks, play fetch until you drop, run an agility course, and just plain wear you out with their energy. In fact, they have so much energy that they won’t be satisfied with just a stroll around the block. You’ll need to plan on at least 30 to 40 minutes of vigorous daily exercise. Be prepared for an energetic, high-maintenance best friend with a vivacious personality. Jack Russell Terriers usually weigh between 15 and 18 pounds and stand approximately 10 to 15 inches tall. They have a compact and powerful little body. Their leg length and body shape can vary widely from dog to dog. Jacks can have either short hair, wire hair, or "broken" hair (combination of the two.) Their coat is mostly white, with black, tan and/or brown mixed in. Nicknames for the Jack Russell Terrier include “Pocket Pit Bull” and “Jack Russell Terrorist.” They have performed in numerous television shows and movies such as Frazier, My Dog Skip, Wishbone, The Mask, Water for Elephants, and many, many more. “George,” a Jack Russell Terrier, from New Zealand is credited with saving five children from being attacked by two Pit Bulls at a carnival. George held them off long enough for the children to escape; unfortunately, George was killed by the two dogs. A statute was erected in Manaia, New Zealand in his memory, and a U.S. Marine donated his purple heart that he earned in Vietnam to the owners of George.